This entry was posted in Doodles and tagged IFTTT, instagram. Bookmark the permalink. Post a comment or leave a trackback: Trackback URL. Subscribe to occasionally brighten your inbox with a bundle of doodles wrapped in a few thoughtful thoughts on being a beacon in this crazy-wonderful world. This blog is chock full of joyful drawings and a few musings on personal branding, startups, creativity and being a beacon. If the drawings on this website give you a smile why not share one? 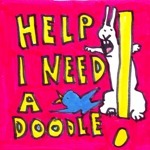 I added a free ecard system so you can send "doodlegrams" to anyone you'd like. Go ahead, send a smile! 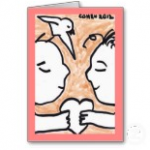 Just click on the words eCard (free) below any doodle on the blog . "I adore your doodles... I swear looking at those bunnies lowers my blood pressure, calms my mind and makes me smarter. Who needs meditation when there are bunnies?"